You are at:Home»Uncategorised»How active is South Africa? If you own a fitness tracker – or you know someone who does – then you know how obsessed a person can become with meeting their step goals every day. Staying active is definitely not a bad thing, but have you ever wondered how many steps everyone else takes? Do you take more steps than the average person in your country? 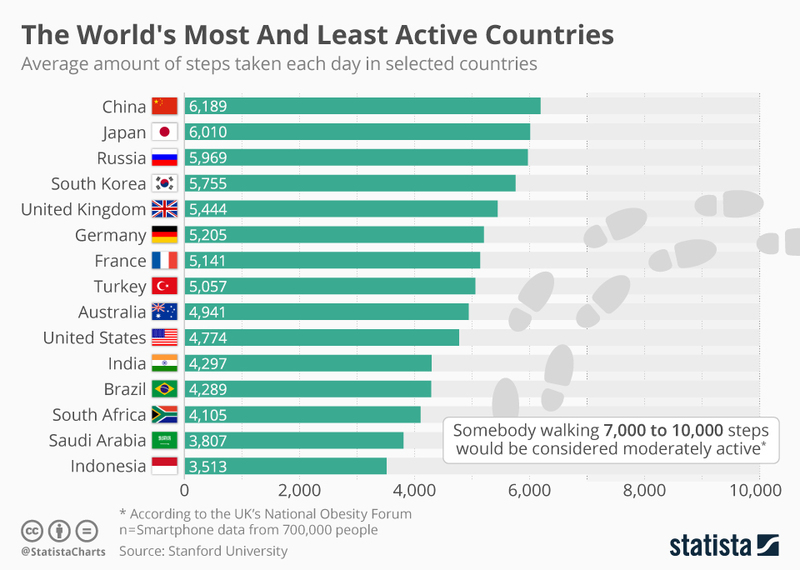 And do people in other countries take more or less steps than you do? Scientists at Stanford University have answered the question of which country takes the most steps (on average by) collecting data on a “planetary-scale” to determine just how active people are in different countries. It appears that each country has its own definition of what is considered moderately active. Japan’s Ministry of Health, Labour and Welfare recommends a person walk 8,000 to 10,000 steps a day, while the UK’s National Obesity Forum says somebody walking 7,000 to 10,000 would be considered to be moderately active. According to the research, on average people walk 4,961 steps a day, which is far less than the average recommended amount. People in China are the most active with 6,189 steps a day while the least active are in Indonesia, averaging a mere 3,513.